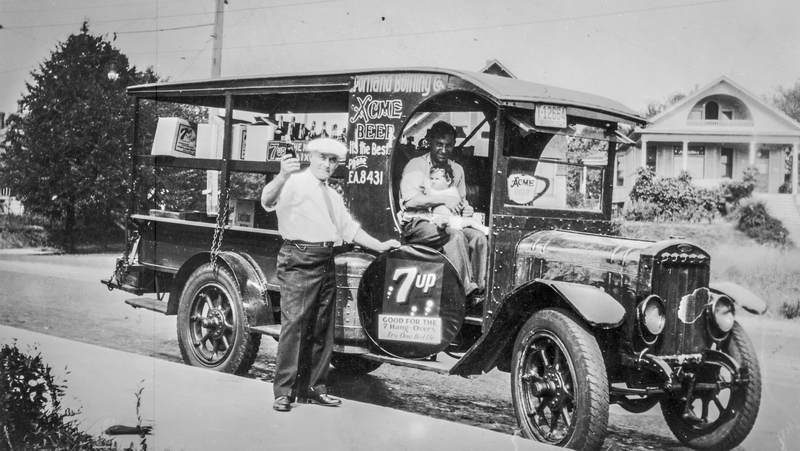 Ed Maletis and family acquire 100-year-old Portland Bottling Co.
Portland Bottling Company founder Andrew Hrestu (seated), with eldest daughter Elaine, delivering 7-Up c. 1930. Industry veteran Ed Maletis purchased the historic company on Nov. 1, 2016. Photo courtesy of the Oregon Historical Society. PORTLAND, OR--(Marketwired - November 01, 2016) - Beverage industry veteran Edward (Ed) Maletis' Limnes Bottling Acquisition Company today completed the purchase of historic Portland Bottling Company from its current ownership group, including majority shareholder Harry Merlo. The acquisition transfers the nearly 100 year-old Company to new, Oregon-based ownership under Mr. Maletis and his family. Mr. Merlo, the venerable Oregon businessman, was the majority owner of Portland Bottling Co. for 14 years. It was important to Mr. Merlo that the business be transitioned to a local buyer who would retain the employees, culture and "can do" attitude that made Portland Bottling Co. successful. The Company was founded in 1924 by Andrew Hrestu, a Greek immigrant, and was operated by Mr. Hrestu and his descendants, including the Rouches family, until they sold in 1990. Last year, Portland Bottling Co. produced more than 10 million cases of ready-to-drink, non-alcoholic beverages in a variety of aluminum can sizes. It regularly ranks in Oregon Business magazine's Oregon Private 150. All 90 employees will remain with the Company, which operates from the 136,000 SF building at 321 NE Couch St. The iconic building, visible from NE Sandy, was constructed by Mr. Hrestu and became Portland Bottling Co.'s headquarters in 1941. Employee dedication, hard work and innovation are credited with sustaining and growing the Company over the past 92 years. "Portland Bottling is just as relevant to consumers in 2016 as it was to the same consumer decades ago. That longevity made it compelling to us," said Ed Maletis, whose family becomes the majority ownership group. "From the popularization of 7-Up after World War II, the Cola Wars of the 80s and 90s, into major shifts in taste of carbonated beverages later, Portland Bottling has always found a way to remain relevant to evolving consumer demands. We are very excited to build the future of the Company upon the legacy of the Hrestus, the Rouches, and Harry for generations to come." Terry Michaelson, the former CEO of Craft Brew Alliance, has been named CEO of Portland Bottling Co., and has invested in the company. He will focus on Company growth in his role. Tom Keenan, who joined the business in 2002 when Mr. Merlo and other investors purchased it, will remain president, and continue his focus on current business operations. Mr. Maletis and his family will guide Portland Bottling Co.'s long-term ownership. "This is a very good day for our team because it was important to Harry that we remain local," said Keenan. "We will miss Harry's influence, but it's easy to welcome someone familiar to us in Ed, who is like-minded in terms of our employee commitments, product quality, customer service and dedication to the region. We are very proud to be able to carry on the legacy that has been created, and to be stewards in developing a Company that can celebrate another 100 years of local ownership." Maletis' grandfather, Chris Maletis Sr., founded Columbia Distributing in Portland in 1935 and shared his Greek heritage with Mr. Hrestu. Both men were born in the late-1800s in the tiny village of Limnes, Greece, near the coast. Their common ancestry, and story of immigration to Portland from Greece as young men, was a factor in the family's interest in the company. Beginning in 1976, Mr. Maletis worked alongside his parents, Chris Jr. and Cleo, and brothers, Chris, Tom and Rob at Columbia Distributing. He became president and CEO in 1993, and guided the company through several important acquisitions from 1993 to 2006. In 2008, Mr. Maletis led the consolidation of Columbia Distributing with Mt. Hood Beverage and Gold River Distributing to create one of the largest diversified beverage distributors in the U.S. He sold the company in 2012. Portland Bottling joins other Oregon-based holdings of the Ed Maletis family, including Oregon Fruit Products and HealthCo Information Systems. David Alexander of Macadam Capital Partners represented the sellers of Portland Bottling Co. in the transaction. Founded in 1993, Macadam is a private investment banking and consulting firm providing services to Northwest based middle market companies.